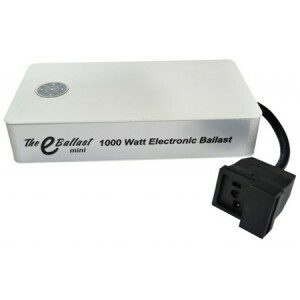 The UltraGrow E-Ballast Mini is a super compact, high efficiency electronic HID lamp ballast that will operate your choice of 1000 watt metal halide or high pressure sodium HID lamps. Featuring a slick, compact modern design that incorporates excellent cooling airflow characteristics, the Ultra Grow E-Ballast Mini has built-in dimming technology that allows the user to operate lamps at 100%, 75%, and 50% output levels. Dimming capability allows young plants to be grown using less electricity, with the ability to add intensity as the plants grow and take up a larger area.